I will admit that I have always been an encourager. As a young child, I encouraged my best friend to be herself and not to let others get the best of her. I have sat with my sister and had numerous conversations about life and living and where God is calling her. I have continually encouraged her. I can’t think of a time when I haven’t been an encourager to others. I see how important it is to cheer on my friends and my family, yet there are times that I need that encouragement just as much as the next person. My soul needs to hear those words of comfort, of cheering, of knowing that I am not on this journey alone. When I graduated high school and was looking for my first job, I wasnt sure where God was leading me. I remember my uncle encouraging me to work at Bible camp. So I decided to give it a go! It was the worst interview ever…I remember looking at the floor and never at the camp director. Yet he took a chance on me and then he couldnt get rid of me. I remember sitting with him and the program director during summer two when they told me they didnt think I would make it but they would take me as long as I would make it. But as you know, I did make it. I worked at SuperAwesomeBible Camp for approximately seven summers. And is the place where I heard God calling me into ministry. After camp and while finishing college, I again found myself wondering what was next for me. I took a leap of faith and toured Wartburg Seminary with one of my friends who was going there to tour. The crazy thing is the moment I stepped onto that campus I knew that was where I needed to be. I remember saying, “God wants me here!” A year later, I started at the seminary. It was not at all an easy journey for me. I struggled but I still stuck with it. I remember how frustrated I was when I couldnt seem to get through my Systematic Theology class. But thanks to a professor who got me and my soul, I took the class as an independent study, we recorded our conversations, I went home and listened to them and then we talked about that conversation at our next session. It was how I finally passed the class! Without that professor and without my awesome friends, I know I would have easily given up but I didnt! During seminary, another moment of encouragement for me happened with my advisor and my candicacy committee. We were sitting in my endorsement interview when one of the candicacy committee members asked me why I struggled so much with Systematics. I answered him the best I could. But the moment I remember the most is what my advisor said. He said, “You know how easy it would have been for T to walk out the door, shut the door and never look back. It takes more courage to stick with it.” Those words were pure GOLD to me! They were the words that I needed to hear…that I could do this and I shouldnt give up! When my sister and I became legal guardians for our mom, I was encouraged by friends to take this leap of faith. When I took this new call about six months ago, I was blessed by people who walked this journey with me and knew when to cheer me on and when to let me know they were praying for me and thinking of me. I am so thankful they are still in my life even though the miles still seperate us. Yes, my life has been full of encouragers yet I don’t always see them especially lately. Being in a new place I am so glad for the friends that have blessed my life in the last months. Yet I still struggle. Did I make the right move? Am I where God wants/needs me to be? Will I be good at this job? And so many other questions fill my heart and mind these days! Yes, yes I will be because God will place encouragers in my life to get me through those hard days. One of the things that I need encouragement most for is not being afraid to take chances and reach out to other single women. At 35 years old, I am so ready to start a family, yet there is no prospects at all in my life! And that makes the waiting so hard! Recently my friend Sarah encouraged me to join one of the (In)Couragers Community groups. And my friends…I took the leap! I spent over an hour reading through the groups and listening for God’s voice to tell me where he was leading me. The Lady N Waiting group was under the singles section and when I read their description, I felt this immediate sense of peace; a place to be me and to be with women who understand how I struggle and yearn for the encouragement to trust in God and Gods timing. I am so thankful for this community and we haven’t even started meeting yet. But when I read one of the leaders stories this afternoon, it was as if my heart and soul jumped right off the page into hers. So tonight I am thankful for so many encouragers in my life; my family, my friends (especially, you tonight, Miss Sarah), my seminary advisor Nate, my seminary professor Winston, those who took a chance on me at SuperAwesomeBibleCamp, my colleagues in ministry and so many more! May we continue to be encouragers to and for each other! 1. TREASURE: What is the best thing you’ve ever found at a rummage sale? Was it a bargain or just something you’ve longed for but couldn’t afford? My friend Gretchen and I were out exploring one day when the community had their city wide garbage pick-up. So it wasn’t technically found at a rummage sale but it was AWESOME! At the time I was looking for a new tv stand, she saw this beautiful dresser sitting out on the curb. She was like you could sand that and spray paint it black, it would look awesome. So we picked it up and loaded it into her vehicle, cool thing was it was actually an old recorder player table. 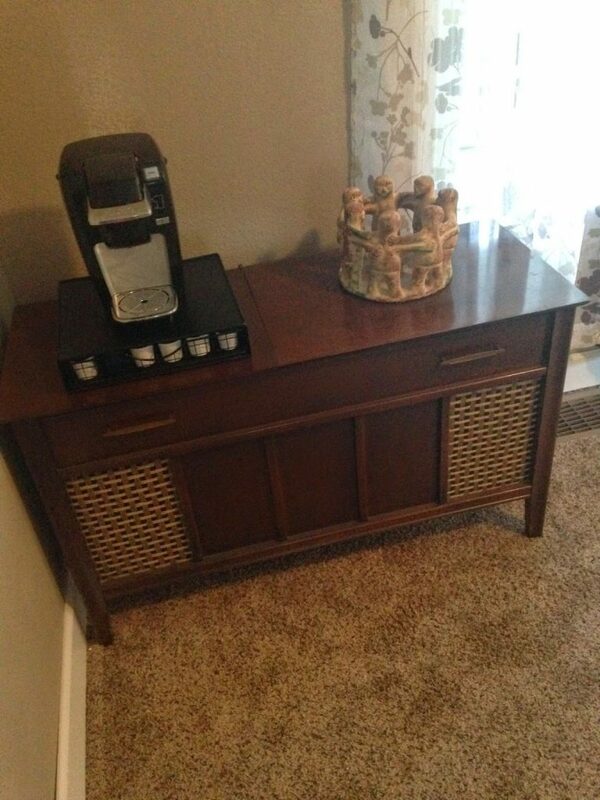 It never did get sanded or painted but it did make the move with me and now is being used as coffee bar. And since it was free, Id say that it was pretty good deal!!! 2. TRASH: What is an item you couldn’t WAIT to donate to a sale like this, and then were surprised that someone not only bought it, they were so excited to have? I cant really think of anything at the moment. 3. BUDGET: How disciplined are you at these kinds of events? Can you stick to a budget, or do you empty your wallet? Depends…most of the time I try to stick to a budget but if I find some really good items that I have been looking/longing for, then it isnt always so easy to keep to a budget! 4. TAKE IT AWAY: What’s something you’d gladly donate right this minute if I would just come pick it up? Probably the many clothes that I would love to get rid of. I got rid of a lot when I moved back in November/December but today I started taking stuff out of my closets again and now they are sitting on my bed waiting to be sorted through but its just such a nice day, Id rather be outside!!! Bonus: Sun tea is great with all the summer foods especially anything on the grill!!! A colleague and friend reminded me of this today. Being in a new place and a new call this is so important! I know there are some who have definitely seen that heart while others I’m not so sure of. I deeply want them to see my heart! I love children especially babies and toddlers! I would do just about anything to cuddle a baby or play with a toddler. I don’t even mind that I have to get down on the floor to play! I also love spending time at my friends house and love when her three year old practically demands that I sit next to her ! That is so much a part of my heart! Probably because I yearn to be a momma so deeply! I also have learned the importance of sharing my story with others! How else will others know my heart? I have so much of my mom’s heart and spirit; yet most people don’t know that she daily struggles with a mental illness! As a daughter of someone who lives with a mental illness that is so much a part of my heart too! There are many other things that make up my heart too! I hope that in this new place people begin to see my heart! In my last call, I believe that they did see my heart and loved me for it! They saw the peace and holiness I felt when I got to snuggle a baby! They saw the joy I had when I got to laugh with kiddos! Some days I see glimpses of people seeing that part of my heart here! And yet there are some times I wonder about what they see! I second guess myself and my actions a lot but then I am reminded to be myself! Easily these words whisper into my ear, “Show them your heart and let them get to know you!” Yes, that I need to remember!! May we all show our hearts; broken, battered, bruised, and pieced together for all to see! Earlier today I was at home for lunch when I turned on The Chew. One of their guests today was Robin Roberts. She was talking about her new book called “Everyone has Something.”She talked about how life is a journey. She said so often we ask ourselves, Will I get married?, Will I have a family?,Will I get that job? She also stated that it is so easy for us to get caught up on those questions but if we remember that life is truly a journey that those questions maybe don’t seem so important. As I heard her state those questions we often ask, I found myself realizing how true those questions are for me. It is so easy for those questions to creep into my thoughts and every day life. I want those things so badly in my life which makes it so hard for me to trust in this journey! And so as I walk this journey called life, I am thankful for those God has placed in my life to walk this journey with me and who continually show me God’s mercy, love and grace! (You know who you are!!!) These people remind me that I am not ever on this journey alone (even thought it may feel that way at times). After some encouragement from my friend Sarah, I joined my first (In) Couragers community group this week! I am excited to see where and how these women will bless my life as we walk this journey called life together especially since many of them struggle with singleness as well. Tonight I am thankful for Robin’s words! May they always serve as a gentle reminder to always trust in God on this journey called life as I wait for my deepest desires to come to light! (3) Reconnecting with a seminary classmate. So good to see her and spend time with her. (4) A compliment from that seminary classmate and friend telling me how great I look! (5) Making and eating an awesome Sundried Tomato and Mushroom pasta in a Garlic and Basil cream sauce! The leftovers were just as good!! (8) Decorating the church with great people for our Celebration picnic. So much fun!! (9) Getting a dance lesson from a dear parishioner. Sad that I accidentally deleted the video but glad I got some fun pics!! (10) Great Celebration picnic!! Visiting, watching the kids have so much fun, and getting my face painted too!! (11) Finally being added as an admin on the church FB page! (12) Getting to spend time with awesome people in my life. (13) Having a four year old insist that I sit by her at supper at her house! So sweet!! (14) Coffee and conversation with a dear friend! So good for the soul! (15) Getting an instant message from my sis asking if she could come visit this weekend. Lots of fun! Picnicking outside, going to the movie Moms Night Out, and so much more! (16) Buying a patio set and putting it together myself! Pretty proud of myself for that!! (18) Eight youth coming to my intro meeting for the National Youth Gathering! So excited!! (1) Lunch with a friend; thanks CD! (4) A coworker telling me that I am a good pray–er!! That I pray from my heart and soul!! (5) Assisting Pr Ken with a Baptism. I got to read and ask the part to parents and sponsor, join in the laying on of hands; and blessing the child; marking him with the cross of Christ!! Doesn’t get much better than that!! (6) Good friends who are determined to help you out! Thanks KD! (9) Getting to talk to a friend who recently moved. I was at Tavern Talk and my friend MJ handed the phone to me so I could answer and talk to KW! So good to talk to her!! (17) Watching our HS seniors come up for the children’s time. Totally spontaneous; put a smile on my face! (18) An invitation and lunch with dear people–so much fun. Cake and visiting afterwards at their house. (20) Finally getting back into reading some books for fun. Current book of choice “The Fault in our Stars” which I am really enjoying! (21) Catching up with Gma on the phone for an hour. Also getting to say hello to Gpa. Love and miss them!! (22) Answered prayers of many friends!!! What joy!!!! Thanks be to God! My mom is a great mom, but like lots of moms, it has not been easy for her. Yet she has always had my sister and I’s best interest at heart. She loves entirely unconditionally! I love my momma with all of my heart, yet there are things that I mourn too! Since she is in a nursing home, I wonder if she will be able to be there when I finally meet my Mr. Right and need to go dressing shopping. I wonder if she will be able to share with me if/when I finally have my own child/children. Mother’s Day is a wonderful day to honor my momma and all the mommas in my life. Yet I know that Mother’s Day isn’t easy for many of them and even me. I have watched friends who have struggled with infertility; waiting, watching and praying for a child. I have watched friends parent children for only a few minutes and then have to say goodbye to them. I have watched as friends have waited to be matched with a child for them to adopt. Mother’s Day is a day to honor all those moms as well! Later this year, I will turn 36 and I’ll admit that my biological clock is ticking…and continues to tick. Just yesterday, my mom asked about grandchildren! I know her heart is in the right place but it still doesnt make it any easier. I so want to be a momma. Something I yearn for so deeply and strongly! Yes, I could and maybe someday will adopt but that isn’t easy to think about either. Who will support me on that journey? What will people think of that choice? And yet the truth is I am not getting any younger, my body maybe won’t be able to carry a biological child. And for that I ache…an ache that is so deep! I so yearn to be a momma! It is one of those very good, yet very difficult things in my life! It’s hard to put into words how deep that ache is and how deep I yearn to be a mom. Yet I still carry that ache and that yearn with me out into the world. 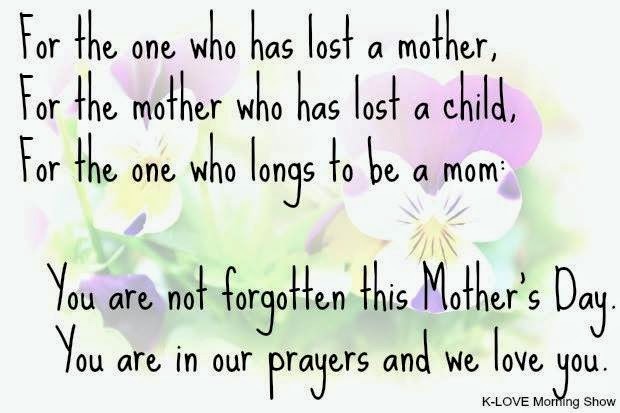 There are so many mother types in the world: those who yearn to be a momma again, those who have had to bury their own children, those who have waited to adopt, and so many more. Tomorrow may we give thanks for all of the Mothers in the world! 1. What is your favorite bird, and why? I love watching birds but I am not sure if I have a favorite. Robins are so pretty. I also think parrots and parakeets are so much fun! 3. 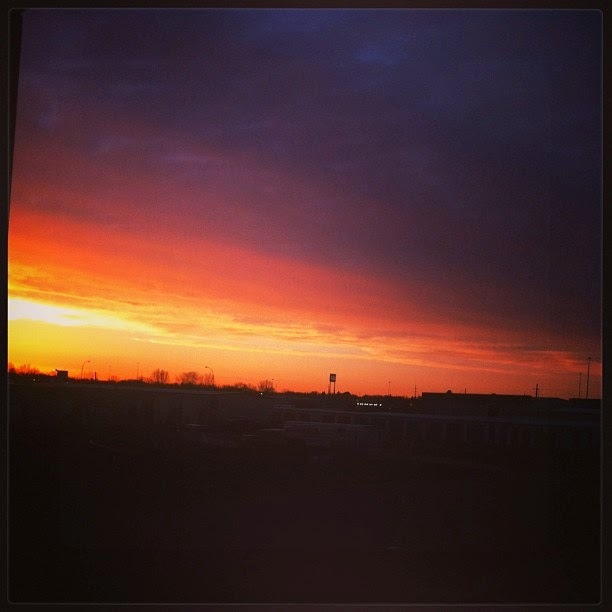 Which do you like better, sunrises or sunsets? Both! There is just something so incredibly holy about both sunsets and sunrises on the prairies of ND! 4. What ever happened to Grape Soda? Yum! Every once in awhile my inner kid comes out and I have to have a Grape soda! I love Fanta and have been able to find it once in awhile at restaurants. 5. Use these words in a sentence: U-turn sign, bat, mouse, cerulean blue, late. The bat was flying through the cerulean blue sky while the mouse came upon a U-turn sign which made him late for supper! (5) Having two of our SS kids share with me about going to the Circus this morning; telling me all about the lions, elephants, zebras, etc! (6) Leading one of the FLC circle Bible studies at one of the local nursing homes; such wisdom in these ladies. I even had one invite me to stay for supper but unfortunately I wasn’t able to do that! (7) Pulling into my driveway and seeing a May Day basket on my porch from the local elementary school. Totally a day brightener!!! (10) A cancellation at the eye clinic so I can get in as early as Monday! Thankful that I will only have to wear my glasses for a few days. Silly me, tore my last contact and I’ve known for months that I was down to my last box! (11) God’s grace is sufficient!! I took my car to a local car dealership for them to check out some stuff! When I got there, they told me there was no charge! So thankful!! (12) A gift from a friend after reading one of my latest blog posts (See pic below) Thanks JG!! (14) Seeing the movie Gods Not Dead! Good movie! I still have the Newsboys song stuck in my head! (17) Snuggling with 4 week old baby girl Lakyn. It’s been so long since I’ve had a baby fix!! I loved every minute of it!